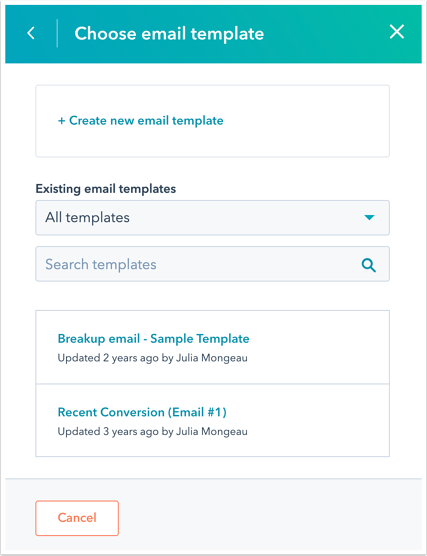 With the sequences tool, you can send a series of targeted, timed email templates to nurture contacts over time. When contacts reply to the email or book a meeting, they will automatically unenroll from the sequence. Sequences use a mix of personalized, well-timed emails and follow-up task reminders to automate your communication with your leads. If you want to automate multiple different actions and business processes for a list of contacts, learn more about using workflows. Please note: the sequences tool is only available for Sales Hub Starter, Professional, or Enterprise users or Service Hub Starter, Professional, or Enterprise users with a connected G Suite or Office 365 inbox, or a connected inbox using IMAP. You cannot use a shared inbox that is connected to the conversations inbox to send sequences. Create a sequence using a mix of email templates and task reminders. In the left panel, select Start from scratch or select a pre-made sequence template. Then, click Create sequence. In the sequence editor, click the pencil icon edit and enter a name for your sequence. To add a step, click the plus icon +. In the Add email template or task panel, you can add an email template or a task to your sequence. Click the Select a template dropdown menu to filter your email templates, or use the search bar to search for a specific template. Select the radio button next to the template to use in the sequence, then click Add. Or, click + Create template. In the pop-out window, set up your email template, then click Save template to add it to your sequence. Select the radio button next to the task to add to your sequence, then click Add. Or, click + Create custom task. In the pop-out window, set up your task, then click Done. Next, customize the sequence step delays. On each step after the first action, use the dropdown menus to set a number of days or weeks that should pass before the next step executes. If you want a task to execute immediately after an email is sent, select Don't delay this step. Please note: the tasks in sequences do not impact sequence enrollment. Contacts will continue through the sequence and receive any following emails based on the delays you've set regardless of whether or not you complete the task. Add steps until your sequence is complete. Each sequence is limited to five email templates, although you can add as many task reminders as needed. By default, sequence emails are only sent on weekdays. If you want emails to send on Saturday and Sunday, clear the Send follow-up emails on weekdays only checkbox. Learn more about sequence email send times. If you want each email in the sequence to thread together in the recipient's inbox, select the Thread follow-up emails as replies checkbox. Learn more about sequence email threads. Select Send follow-ups within a time range, then use the dropdown menus to set a time range for each follow-up email to execute in the sequence. If you're a Sales Hub Professional or Enterprise user, select Send follow-up emails at recommended send times to send follow-up emails at a time with the highest open rate for that day. This time is determined by HubSpot. To re-order the steps in the sequence, in the top corner, click the up/down arrows. If needed, you can edit the email template or task directly from the sequence. In the top-right corner of your task or template, click the pencil icon edit. Edit the email template, then click Update existing template to add your edits to the current template, or click Save as new template to create a new template. Edit the task's name and type, or assign the task to a different queue. Click Done. To remove a step from your sequence, click delete delete. Please note: you can edit your sequence templates for contacts that are currently active in a sequence. Learn more about how changes to an active sequence can impact your contacts. When you have finished editing your sequence steps, click Save. When your sequence is set up, learn how to enroll your contacts in a sequence.